Google has denied reports that it is looking to use unmanned flying spy drones to augment its Street View and Maps features in the future. Earlier news reports claimed that Google was working with one German manufacturer, Microdrones with the latter company claiming to have sold an unmanned flying drone to Google. Microdrones has already supplied such unmanned aerial vehicles (UAVs) to British police and special forces. "The drones are well suited to deliver up-to-date image material for Google Maps." When contacted about the news, a Google rep told TechRadar that the company was, "always looking at ways to improve our mapping services," though was quick to add that, "as part of this effort we explore many different technologies but we are not using or testing this one." The Google rep also informed us that Google currently has no current 'business relationship' with Microdrones, suggesting that the current spate of news stories was based on little more than the fact that the company has bought a single flying drone from the Germany company. Additionally, while Google claims that it has no current plans to roll out the use of such flying photographing drones to augment Street View or Google Maps, should the company want to pursue such a plan in the future it is also likely that Google would require authorisation from the UK's Civil Aviation Authority (CAA) to ensure the use of such unmanned drones was not a threat to public health. A CAA spokesperson told PC Pro earlier this week that: "Any systems like this would need CAA approval, particularly if it was a new system that we hadn't seen before, [as] we didn't know how safe the device was. "The prime consideration would be over safety and if it is a system that we have already approved that would be taken into account." "A lot would depend on the purpose. For example, a celebrity wedding might attract special attention, and the area that it planned to fly in might make a difference, but if the UAV was safe then we would consider allowing use." 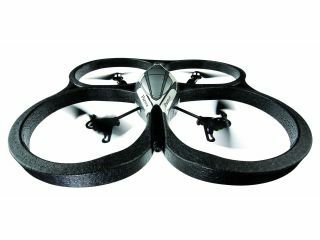 You can see more about German drones manufacturer Microdrones over on its website.